I may have written about this before during the Slice Challenge, but I'm feeling a real need to put words down about my feelings right now, so please bear with me. I had to say goodbye to my oldest daughter Sunday. She was headed back to her current home and workplace in Washington DC. She loves her job, she loves her friends, and she is a real success story in that she had few friends and no job or place to live when she first moved to DC. I am both equal amounts of proud and happy when I think about her life now. But the hardest part of all of this for me is that she lives apart from us. On a day to day basis, I'm fine with that, knowing how much she loves her new home. But when it comes time to say goodbye after we visit her or she visits us, I'm a soggy natural disaster!! I hugged her Sunday, and didn't want to let go, all the time crying. My intention is not to make her sad or upset; I just know I'll miss her until I can see her in person again. My grandmother, who lived in Arizona, used to be the same way at the end of our yearly summer vacation visits to see her. I have definitely become just like her. A full-on waterworks when it's time for the goodbyes. I have no solutions, but I just really needed to channel my feelings of sadness, so writing was the first thing that came to mind. Thanks for understanding. Sunday was a real rough patch for me. 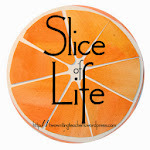 Thanks to Ruth and Stacey for hosting us on Tuesdays -- I'm delighted to be continuing my membership in this writing community that meets every week for Slice of Life Tuesday. And on this day in particular, I'm so happy that there is this forum for me to express my emotions. I didn't get as much read this week - oldest daughter was home on vacation for a week from DC and I was putting last touches on a workshop I'm actually doing today - but what I did read was so amazing, I had to share at least a short post today. 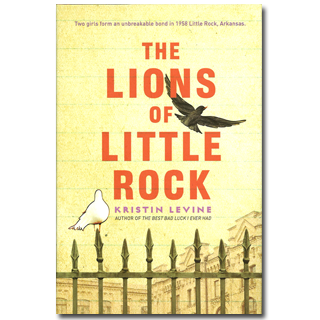 The Lions of Little Rock by Kristin Levine -- Ironically, I had been reading this book when I saw Bill review it on our blog. In my humble opinion, I couldn't agree with him more that this was an amazing book, and one that deserves extra notice next January. This book will be part of my class this year - trying to decide what is the best fit - whole class read aloud or a book club. Really leaning toward whole class -- would be a genre I don't read a lot (historical fiction), and it's a wonderful story I want to share with as many children as possible. 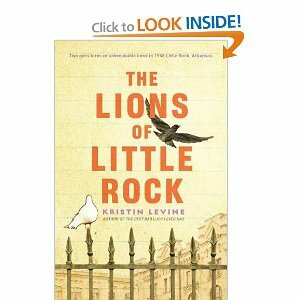 The Lions of Little Rock definitely makes the list of my Top 5 favorite books so far in 2012, and that's high praise this year when so many wonderful books have been published. 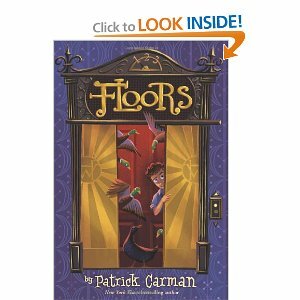 Floors by Patrick Carman -- Floors was also recommended by my blog partner, Bill, and what a great recommendation it was! The setting is the Whippet Hotel in NYC. This is not just any hotel; this hotel has so many mazes and hidden parts it was sometimes overwhelming to keep track of everything, but always fun and adventurous. I know Bill just picked up the ARC of the book that is the sequel to Floors, so I'm hoping it will tie up some loose ends about the ending of this first book for me. But I think kids will love the zaniness of the Whippet Hotel -- it's like a hotel and amusement park all wrapped together. Porch Lights by Dorothea Benton Frank -- Just started reading books by Dorothea Benton Frank this summer - why did I wait so long? This is her most recent one with Sullivan's Island as a background. I love her Southern characters. But I do get famished while reading her books because the cooking described within is amazing! **Note: this was my adult read for the week; not a children's book. One of the most important things for me as a learner during these #cyberPD chats is reading what everyone else has had to say about the same thing I read. Last week, I wasn't surprised to see how many people focused on that powerful word, "yet". But I loved, and probably grew the most, from the comments and thinking that were slightly different from mine. Had I just been reading this book on my own, I wouldn't have the depth of thinking this PLN has provided. Thanks to this #cyberPD community for your reflections!! Knowing the power of others' reflections, I was really looking forward to this week's assignment, knowing that the first chapter we were reading dealt with feedback, praise, and other responses to students. Before reading the chapters for this week, I shared with a group of teacher friends that my "behavior management" plan has always been to notice students doing what they should, and try to encourage others to do the same, and after just reading the first three chapters of Johnston's book, I was pretty sure I might have to rethink this. "I like how Sally got her read aloud notebook and came to the floor so efficiently." "I like how Sam spent some time organizing his thoughts before writing." So I began the reading, and then, KABOOM! I got to the top of page 42, and I knew I was right about rethinking these types of statements. To use Johnston's words, "The 'I like...' part is not as helpful. Rather than offering an agentive narrative, it offers a judgment and implies that the point of the child's efforts is to please you." So I'm going to take Johnston's suggestion and focus more on, "Look at how you..." I'll be taking out the part where the students need to please me, and focusing more on the process of what the students are doing. My goal is to focus less on judging, and instead "position myself beside rather than above the student." I loved the examples Johnston gives of writing conferences which really focus on cause/effect: saying to a student that you noticed they did a particular thing, and it resulted in a specific effect in that piece of writing. One of my favorite phrases in chapter 4 was "feedback is cast in a language of possibility rather than criticism." That phrase is one I will ponder and "carry in my pocket" all year long - the "language of possibility" - what an important goal for which to strive. I believe it will change the dynamics of my relationships with all students. What Johnston had to say about the importance of dialogue, dialogic classrooms, and uncertainty in chapter 5 were all important and powerful messages for me. I've decided to just list some thoughts I had as I read about these. I was not shocked to read the research about 8th and 9th grade English classes and their lack of dialogic interactions. Let me clarify that that isn't a judgement about those particular teachers, but rather an observation that, as my own children went through the school system, dialogue was not always valued in some grades and across subjects, but certainty was. As a parent, I want my child to be so much more than just someone who can spew back information. I want my child to be a consumer of information, who then processes it in many different ways that help them make sense of the world around them. I thought a lot about where the control lies in my classroom. While I would like to think that my beliefs in children and in workshop make it a democratic place, I know that control is a hard piece for me to relinquish. However, as I read the suggestions on page 55 of how we can start to take ourselves out of a controlling position, I realized that I do several of those things all the time: wait time, taking ideas seriously, asking open questions. What I will be working on: not judging with my word use and collaborating with the class so the control of who talks next doesn't always lie with me. Ann Marie Corgill had already paved the way for my thinking about this. In a recent edition of Big Fresh from Choice Literacy (one she had written before), she thinks hard about classroom space so that all the students sit in a circle when they came together to think, giving the class more equality. In addition, she works very hard at the beginning of the year to establish expectations of how her students talk with one another. It doesn't involve raising hands - something I can't quite seem to master... yet. Loved the idea of changing the name of "read aloud" to "thinking together with books". While I think my classes have always known it is the latter, the semantics are pretty important. I plan on introducing uncertainty into my classroom on a constant basis. The quote "uncertainty is the foundation of inquiry and research" spoke to me -- we start our year wondering about topics together. Continuing to push where we are uncertain will help us all grow. I thought about my own growth as a learner when I read this part. I push forward in my learning because I reflect, possibly question a practice, and am uncertain. My best learning occurs when uncertainty is present; why would I not want that for my students? I haven't used Voices in the Park in recent years, but may need to bring it back this year. The concept of understanding multiple points of view might be a great way to begin our year together. "As teachers, we increase our skill at social imagination the more we listen to children." One of the many things I plan to do this year will be to listen so that I know my students and can help meet the needs they have that will allow them to be productive citizens. I can't wait to read what everyone else thought about this week's reading. This week, Jill Fisch at My Primary Passion, will be the hostess for our #cyberpd thinking. Have a great week! I had a very fun, busy week so I didn't read as much as last time, but what I did read, I really liked. After the #titletalk in April or May, where the conversation focused on graphic novels, that has been a real goal for me. 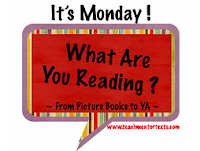 I read 4 books in this genre, and all of them will be perfect additions to our classroom library. The Flying Beaver Brothers -- I read both The Evil Penguin Plan and The Fishy Business. So fun! 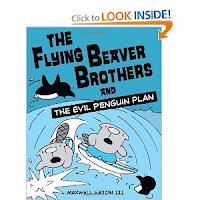 This book and the second in the series, The Fishy Business, just make me chuckle. A great addition to the graphic novel section of our library. Babymouse for President -- How is this book not perfect for an election year?!! Babymouse is back with all her silliness; such fun!! Every time I read a Babymouse book, it cracks me up when she thinks/dreams in pink. Wild Pitch - I have heard many great things about this graphic novel series from Sports Illustrated Kids. 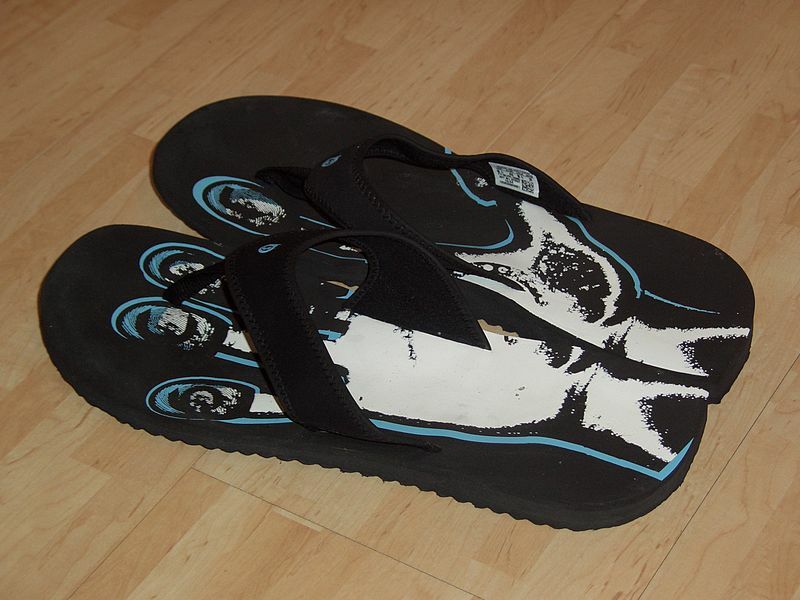 Cannot wait to add more of these to my collection! Will want to talk to students about how to read it though, because important information starts on the inside cover and continues all the way to the back cover. Sports fans will be sure to enjoy these series! Wumbers - - Kids will have a great time with this book by Amy Krouse Rosenthal. 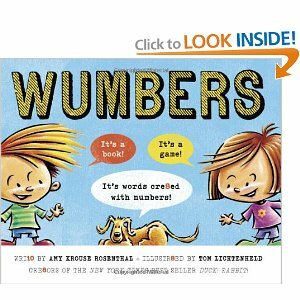 The entire book is just word fun galore, with Rosenthal spelling words that have numbers in the place of certain syllables (It's words cre8ed with numbers!). I think it would be a great way to stretch vocabulary and play with words for students. 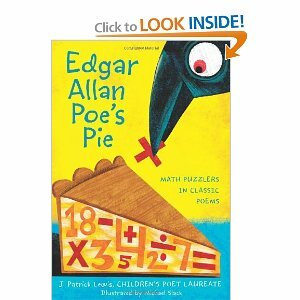 Edgar Allan Poe's Pie -- I found this book recently at our local bookstore, and had to have it. I am a huge fan of the prolific J. Patrick Lewis. 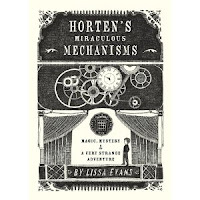 This book of poetry is unique for 2 reasons: 1) each poem is inspired by an already existing poem written by some great poets (not sure kids will get all the references, but I had a great time connecting the originals I knew with what J. Patrick Lewis wrote), and 2) each poem is a math riddle. I plan on buying a second copy of this book to give to my teaching partner as a back to school gift. It would be great fun to use these poems in some way during her math times with our students. And I finished one YA novel, Crossed, by Allie Condie. I like Matched (the first in the trilogy) better because in Crossed there was one character who made a brief appearance and then is only referred to after that -- I feel like he is a major player and we needed more of him (plus I really like his character). I will definitely be reading the 3rd in this trilogy to see how Condie wraps up things. From Peter Johnston's very first quote, "Children seldom misquote you. They usually repeat word for word what you shouldn't have said," I was hooked. My self-reflection with Johnston as my guide had begun. That quote made me think about all the times I had started a conversation with a student, only to have it fall apart because of something I said, wishing I could take it back. Johnston couldn't have set the stage more perfectly for me. He gave words to things I do, and things I wish I did more often. One of those was the idea of rehearsing agentive narratives with students. To use Johnston's words, "Errors usually happen at the edge of what we can do, when we are stretching into new territory - when we are learning." This rehearsal happens often in my class, especially in the beginning of the year, as we're establishing community in our class. I want students to see how I work through issues when things get difficult, and then I want to identify the same actions when students work through something as well. But I found myself wondering why, at certain times of the year, I forget these important lessons. Why in January, when I'm reflecting on what learning paths we still need to travel, do I get anxious, and start pressing a little more, giving less time for these important rehearsals? So, when Johnston went on to say that, "Teaching is planned opportunism. Teaching requires constant improvisation. It is jazz," I realized what a perfect analogy that was. To keep me mindful of the jazz and improvisation that needs to occur, I am considering actually putting jazz music into our classroom - having it be the opening of our day, possibly play it during transitions, and see how it works to have jazz as a backdrop for writing workshop. I think the auditory reminder of the improvisations that always occur in jazz will help me be more mindful of the improvisations that need to happen in our classroom as well. This particular reflection was a perfect introduction into the powerful Chapter 2 where Johnston so carefully builds our background knowledge about the difference between "fixed performance frame" and "dynamic performance frame." Understanding the theories behind these performance frames was a powerful learning for me, and a humbling one as well. The further I read in chapter 2, the more I found myself really sitting up and paying attention. First of all, as a former special education teacher, I realized what a catch-22 being identified as someone needing more assistance really is. While it is a good thing the student is getting more help, Johnston is correct in saying that those students are always working on their identified deficits. How vitally important it will be for me to celebrate with ALL students their successes as they work through something in reading workshop, writing workshop, or word study. I want all those successes in their learning process to help them want to tackle more and more, and feel confident about it. Another eye-opener for me was, "Children who adopt a fixed-performance frame tend to become helpless when they run into trouble. They cease being strategic." It's that learned helplessness that I've seen time and time again in students. Getting them to break free and take risks is an important goal. But, like with Johnston's Choice Words, I realized that these concepts apply outside the classroom as well. How frequently have I heard adults/colleagues say they just can't get something? Actually, I'll use myself as an example. For well over a year, I've wanted to learn VoiceThread, but I just heard myself say the other night to a colleague for the 100th time (she must be getting tired of hearing it), "I really need you to help me. I just don't get VoiceThread." While I always do better in learning something when I have a visual model first, when did I become so dependent? I'm a pretty good problem solver normally. A lot of self-reflection on this one! "Within a fixed performance perspective, people can be judged quite quickly." Later in the same chapter, "If we judge quickly and stereotype people, it will limit our likely relationships with them." Once again, my reflections on both of these statements fell in the classroom setting as well as the personal arena. With a few students I've had in recent years, I definitely type-casted them after awhile, and once that's done, it's hard to reverse. That will be another goal for me as a teacher this year. As a person, these statements really made me think. I find that with children I can be encouraging and patient most times, but with adults I don't always exhibit the same care. This was a huge reflection, and one I will need to ponder for quite some time. Chapter 3 was a great chapter of hope for me. After being quite hard on myself as I reflected on the first two chapters, chapter 3 opened the window for ways in which I can develop; can change the "learning narratives." But as well as hope, it presents a challenge as well. I want to adopt a more dynamic learning performance frame for myself, which will hopefully result in a change in my narratives with students, peers, family, and friends. That's a lot of narrative!!! As a language arts teacher, I really loved what Johnston had to say about not assigning character traits to people. If that shouldn't be the goal (and it shouldn't), then we do have to be careful about talking about characters in literature. To use Johnston's words, I will be talking with students about characters "in terms of internal states, feelings, intentions, contexts, and change." In fact, because of that, I will be choosing read alouds for beginning of year with that in mind. Finally, "yet" will be my new go-to word this year. As Johnston states, that one little word can really change the dynamics of a statement or a thought. I haven't learned VoiceThread... yet. But I will. 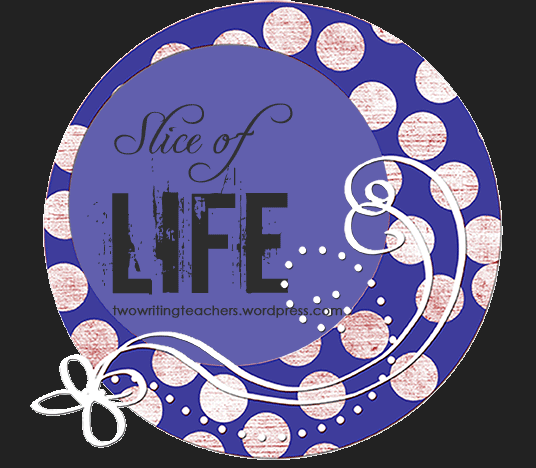 For more of the great #cyberPD reflections, head over to Cathy's Reflect and Refine Blog. Thanks so much for hosting us today, Cathy! As I mentioned in my last post from a couple of weeks ago, I was in Dallas for the Junior National Volleyball Tournament. The boys did well, 19th over all and it gave me lots of time to read. One of the titles was Justin Case: Shells, Smells and the Horrible Flip-Flops of Doom by Rachel Vail. 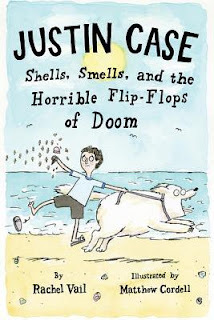 I was a big fan of the first Justin Case book, School, Drool and Other Daily Disasters which Karen reviewed here and was excited to find volume 2 on my library's shelf of new stuff. For those of you who aren't familiar with Justin, he's a worry wart of a kid, always nervous and trying to figure out the social scene of elementary school. In Shells, Smells, and the Horrible Flip-Flops of Doom, Justin goes against his better judgement and decides to attend Camp Goldenbrook. It's camp where Justin thinks he will learn to be more of a "rough and tumble kid" instead of such a worrier. Instead of doing experiments and scientific investigations every day, Justin will be playing dodge ball and learning to swim, two things that are definitely out of his comfort zone. In order to get ready for camp, Justin must come to grips with changing clothes in a locker room in front of other people. Other campers teach him the trick of holding his towel in his teeth so nobody can see anything. He must learn to deal with having no real friends at camp. He knows several sporty kids who attend Camp Goldenbrook but they're not kids he would normally spend time with. 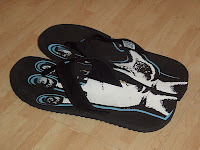 Along with many other hurdles, including a bully of a counselor, a mean kid who takes advantage of the less athletic and eating in a place the call The Mess where they serve hockey pucks and bug juice, Justin has to get used to the "flip-flops of doom." Actually he just needs to get used to that little thing that goes between your toes and rubs your skin raw. I feel his pain, I never liked that little thing! In the end, Justin discovers a lot about how strong he is and stands up for himself. At some point in the story, I thought I had it all figured out, but Justin not only surprised me, he surprised himself and really expands his horizons. I know kids like Justin who want to try new things and move beyond where they are, I think this book might help them figure a few things out. I'll definitely be recommending this book to my 3rd graders in the fall. Fans of Alvin Ho will enjoy Justin Case. This morning, I was meeting with a friend and colleague to plan an upcoming workshop we will be doing. We had to start at 7:30 just to be able to mesh times between her schedule and mine. She mentioned how great it is that we have the gift of time in the summer to do things like this; summer gives us a flexibility we don't always have during the academic school year. When she said that, I realized I knew what my slice of life would be for today!! In June, I went to Warsaw, Indiana and attended the All Write Institute. The time I spent learning and talking and collaborating with others was invaluable! A small group of teachers (Cathy, Deb, and Nicole) in the central Ohio area who share a love of queso have gotten together two times - the first time in June and then we're meeting again tonight. We're bound by our love of food and our desire for knowledge. We meet on screened porches and patios, we share amazing things we've learned about technology for the classroom and good teaching practices, and we support one another by being there when someone wants to try something out of their comfort zone. In addition to food, these meetings have iPads, Kindle Fires, laptops, smart phones galore to play with, to model, and to share with one another. Susan Dee from Maine and I skyped for well over two hours the other week. Titles of books, technology thinking, ways to collaborate for both us and our students -- what a gift to have Susan "in" the room with me. So, I'm doubly excited that Susan will be "joining" the queso group tonight. She brings such smart thinking to the room! I'm fortunate to be planning a Choice Literacy workshop with Katie DiCesare again this summer - our topic is about what happens in primary and intermediate language arts workshops. If you've ever planned a presentation, you know that the learning that goes with the planning is immense. Not only have I been pushing myself professionally, but I've also had to reflect on some of my own teaching practices. Reflection is good for the soul. Right after this presentation, I will have the pleasure and joy of attending a three day writing retreat. I look forward to a safe environment where I can learn to actively participate in critique groups, both as the giver and the receiver of responses. It will also be wonderful to learn writing tips from people I trust immensely, and have three days of digging in as a writer. Tomorrow, I begin the #cyberpd for Opening Minds: Using Language to Change Lives by Peter Johnston. I love that I can read the assigned readings for the week at my leisure, and then have a blog post ready to go for the next 3 Wednesdays. And the other joy of this group is then looking at the other participants' reflections as well, and then responding to them. Talk about going deeper with my comprehension of a text. And summer has given me the time to participate in many twitter chats. The #oneandonlyivan chat sponsored by John Schu and Colby Sharp was wonderful, and makes me look forward to next week's #wonderofwonder chat (same cohosts). Thoughts were just flying the first time!! And then tonight, there is a chat for Pathways to Common Core chat tonight at EST. Learning opportunities abound! I will also be planning a presentation with two very smart Dublin colleagues about BYOD (bring your own devices), and great websites for kids to explore. This is for a leadership academy our district hosts. Once again, the opportunity to think outside of a normal schedule with these smart ladies will be wonderful! Finally, I have had an opportunity to plan with another group of Dublin colleagues for a word study session for 5th grade teachers in our district. Again, lots of time to reflect on my own practices while trying to pull together a meaningful session for the attendees. I'm sure there's more, but as you can see, so much has happened with my learning and growth as a professional this summer. Thank heaven for the different pace of the summer that allows such opportunities to happen. Because I took a break last week from posting, I have read so many delicious books in the last 2 weeks, I'm not sure where to start, so I think I'll just share the highlights by category. First of all, as I've mentioned on twitter, I have become addicted to our public library this summer. I go to the library and least once a week, and never bring home less than 8 books each time. This is a picture of my most recent haul: you'll see some YA titles, some middle grade chapter books, and two adult books by authors I love. In addition, here is the bookshelf in my living room - the 3rd shelf and the 5th shelf are all library books. I plan on having plenty to read at all times this summer! - When Foster holds a cookbook she gets from the bookmobile over her heart, the librarian says, "That's where a book should be carried." - "There's nothing wrong with having a different way of learning. What's wrong is when people blame you for it." - "Cooking is about life. It gives us what we need to keep going, and it gives us something to share with other people." "But for now, I'm going to make the world a better place one cupcake at a time." 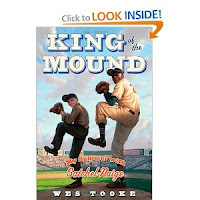 King of the Mound: My Summer with Satchel Paige: I was at our public library reserving books, and I just happened to check my GoodReads. 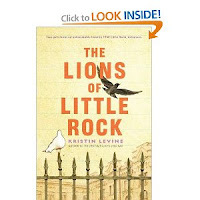 Noticed that a friend I trust for recommendations had recommended this sports historical fiction. For any students who really enjoy baseball, and liked We Are the Ship by Kadir Nelson, this would be a perfect fit. I enjoyed so much about this book: each chapter is sequentially titled with what inning it is and whether it is top or bottom of inning (so clever), the main character had polio but learns to overcome some of the disease's obstacles, the main character and his father have a very strained relationship which made for good reading even when I didn't like the dad, and the best part of all was how the author took real events from the life of Satchel Paige and fictionalized their context for the story. The author takes a good look at the bigotry of the time as well without being too preachy. I would agree with my friend, Susan, who recommended this book - King of the Mound is a must read (and now for me, a must buy!!). The Year of the Book by Andrea Cheng: I enjoyed Cheng's Where the Steps Were, so when I saw this on our public library's new book shelf, I grabbed it. In addition, several twitter friends have read it lately. Anna, the main character, could be a member of the #nerdybookclub. She always has a book at hand. I love the artwork where it shows so many great titles Anna has read. More of a girl book as a little girl is trying to find where she fits with the other girls in her grade; she would much prefer to read rather than be involved in their drama. Great read and a wonderful book to share with my students. Capture the Flag by Kate Messner: Really enjoyed this book. Definitely has a good guys / bad guys thing going on. I think kids will really enjoy the antics of the four children trying to solve a big mystery, and will laugh at loud at what befalls some of the adult bad guys. In addition, they will enjoy the silliness of the plot along with the idea of a secret group of people trying to protect things, references to video games to help capture the bad guys, and references to Harry Potter by one of the main characters. This was just a fun book! Plantation by Dorothea Benton Frank: What a perfect book to read on a summer's day - full of lovely, quirky characters and the charm of the South. I currently have her latest, Porch Lights, in my TBR pile. Island Apart by Steven Raichlen: This book literally just came out this month, and I was fortunate enough to get in from the "new books' shelf at our public library. It was a perfect summer read - it is set on Martha's Vineyard, it talks about amazing food, and there is a romance piece, but not an over the top one. Reading this makes me want to head to Martha's Vineyard asap for some amazing seafood. Calico Joe by John Grisham: I really enjoy John Grisham as a writer, but this is an entirely different side of him. He tackles a story about baseball, with one narrator, the son of a so-so Mets pitcher who had a serious anger management issue. Even with the one narrator, the story is told in two parts, jumping back and forth, between current day and 1973. This is a work of fiction, but Grisham seamlessly fills in the story with real players and real games. Great for baseball fans, but also just a well told tale. 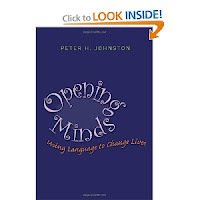 Opening Minds by Peter Johnston: I am participating in a #cyberPD that begins this week. I have read the first 3 chapters, and will be writing a reflection about them to be posted this Wednesday, July 11. I participated in this #cyberPD last year, and loved the interactive part of it. After you post your own reflection, you head to other participants' blogs and post on theirs as well. It culminates in a twitter conversation with all participants. For more info on this great opportunity, check out the details at Cathy's blog, Reflect and Refine.